"Old LA 2040" is only in the PC version. "The Age of Policenauts" was an original song done for the Black Disc, if I'm not mistaken. Beat it yesterday! Great game Thanks to those who translated it. Shame it isn't in the PSX version. It's a class tune. Beat it once last summer and was playing it again recently but my save files got corrupted for some reason. Thanks to all who put the work into translating it. i just beat it. thank you to everyone who translated this game. i know a lot of time and effort went into this and it shows. 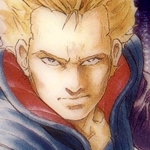 Think this will be my first post, though I've been lurking for a while ever since I finished Snatcher a few years ago. Woke up around 2:30am and could not get back to sleep, so I decided to pickup where I left off last. It's now 6:40am and I have finished Policenauts for the first time. Thank you to everyone involved who have translated this wonderful game for a whole new audience to experience. Beat the game today, after a long time of here and there play. "Throughout history, suspiscion has always bred conflict..."
"Rise from your grave" - I'm back from the dead! Totally fantastic, thanks to the translation team. Amazing game and incredible work on the translation too. Thank you for all your effort! Definitely deserves a full US and European release. Thanks to those that did the translation Great game! Beat in on EPSXE around the August of 2010. This was probably the best digi-comic, no make that the best game i've ever played. Thank you so much Marc, Slowbeef, Artemio, and all the rest! Im going to replay the original Japanese version now. This game is a must play for anyone who is looking for a good digi-comic. Greatest game i have ever played.From the Wonderful opening till the wonderful ending. No,actually This is not a game.Its like a great movie.You are going to watch it again.every once in a while. No,actually This is not a game. No, it's a video game!! "you read bunch so it is a book/movie, not really a game"
No! It's just a different type of game! There's way more to it then just being a book/movie or even it being a visual novel. It's a mother f*%@ing Japanese point & click adventure game! Nuf said. What Button Do You Press To Jump!?! Beaten it before my 19th birthday via PSP. Made my day. Just beaten it today while reading the slowbeef translation. Great game, as it holds up even to modern games. Hope the Saturn patch comes out soon! I beat it once a long time ago. A bit more recently I played it live on the internet. Just as glorious as I remember. I just finished Policenauts thanks to the English translation. I loved it. I wonder why Konami does not port it on recent computers and tablets, it would still find an audience I'm sure.